Product Dimension: 20" × 20" × 4.3"
Package Dimension: 13.8" × 13.8" × 4.8"
Our product is literally elegant. It is easy to hang on any nails and hooks. The product is made from healthy and eco-friendly materials. 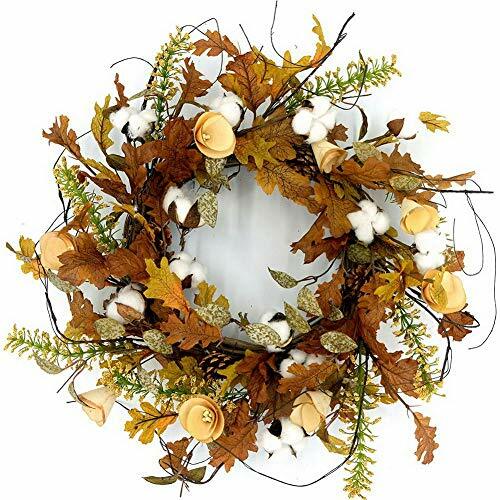 It is decorated with cotton, leaves, natural boxwood and pine cone, which gives you a realistic feel. It is suitable for front door, hallway, entryway and so on. It is perfect for enjoying the beauty of craft without any mess or maintenance. It was made for a wonderful and affectionate gift for your family and friends. In addition, it is a charming decorative display in your home. 1. Products may vary slightly piece to piece. 2. Due to lighting and different computer monitors, please allow slight difference in color. 3. Due to manual measurement, please allow slight difference in size. If you have any questions about this product by Idyllic, contact us by completing and submitting the form below. If you are looking for a specif part number, please include it with your message.